Click here for full flyer and details. Bassam Lahoud is an architect and a member of the Order of Engineers and Architects of Beirut. He is also a professional photographer, member of the Press Photographer Syndicate and the Union Catholique Internationale de Presse in Lebanon. He is the chair of “ESCWA arts council” at the United Nations, a founding member of the magazine “Prestige”, and founder and president of “the Lebanese House of Photography”. Lahoud has been on the faculty of the School of Architecture & Design at the Lebanese American University for more than 30 years. He served on several national and international photography juries since 1982 and has to his credit more than 50 photography exhibitions around the world. He has been awarded the Spanish “Order of the Civil Merit, Grade Commander” from King Juan Carlos of Spain and the Spanish government. Join LAU New York for our 7th Annual Gala. H.E. Nayla Moawad is the founder and honorary chairwoman of the René Moawad Foundation USA and president of the René Moawad Foundation in Lebanon. As the widow of the assassinated president of Lebanon, René Moawad, she sought to honor her husband’s legacy of promoting peace and social justice by founding the René Moawad Foundation in 1991. She has succeeded in taking this organization from a small charity to a multifaceted developmental organization. The René Moawad Foundation enjoys broad international and U.S. support for its efforts to promote sustainable human development in Lebanon. From 1962 to 1965, Mrs. Moawad worked as a journalist for the daily newspaper, L’Orient. In 1965, she married Lebanese Member of Parliament René Moawad. Her husband was assassinated in 1989, two months after being elected president of Lebanon. In 1991, Nayla Moawad started her political career as a member of parliament, and in 2005, she was appointed Minister of Social Affairs. During her decades-long career as a politician, she has campaigned for women’s and children’s rights and has opposed political corruption, serving on numerous parliamentary committees, specializing in finance, children’s rights, and education. Mrs. Moawad has worked to pass important legislation affecting the lives of children, including a law that increased the minimum age of employment from 8 to 14 years old and a law that made basic education compulsory and free of charge. She is a founding member of several political groups like Kornet Chehwane and the Democratic Forum. 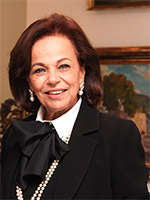 Nayla Moawad was born Nayla Issa El-Khouri in Bsharri, Lebanon. She graduated from Saint Joseph’s University with a B.A. in French literature and history. She later studied English at Cambridge University in the United Kingdom. Mrs. Moawad has a daughter, Rima, and a son, Michel. Rima earned her LLM from Harvard University and is an attorney at law at Proskauer Rose in New York. Michel is currently a member of the Lebanese Parliament and Director of the Rene Moawad Foundation. Mr. Joseph Georges Audi is the chairman of Interaudi Bank. He has served as president and CEO since the bank’s inception in 1983. In 1971, Mr. Audi began working for Banque Audi SAL, a leading Lebanese bank and part of a long line of Audi family banking enterprises dating back to the nineteenth century. He later moved to Paris to establish Banque Audi France and became its first president before moving to New York in 1982 to establish Bank Audi USA. Interaudi Bank, previously Bank Audi USA, is an FDIC insured full-service bank chartered by the state of New York with approximate assets of two billion dollars. Under Mr. Audi’s leadership, the bank has been profitable every year since its founding in 1983. 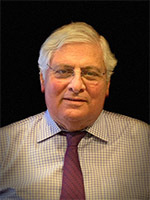 Mr. Audi has served as a trustee of the French American School of New York and as a member of the Dean’s Council of the Kennedy School of Government at Harvard University. He is also a board member of Action Against Hunger, an NGO dedicated to ending undernutrition around the world. In recent years, Mr. Audi has graciously provided scholarships for LAU students to spend a semester studying in New York City. Mr. Audi, a proud US citizen, was born in Lebanon. He holds a graduate business degree from Hautes Etudes Commerciales (HEC) in Paris, France, and attended law school at Paris Assas University. He and his wife Claude Audi have been married since 1975. They are the proud parents of four sons and five grandchildren.